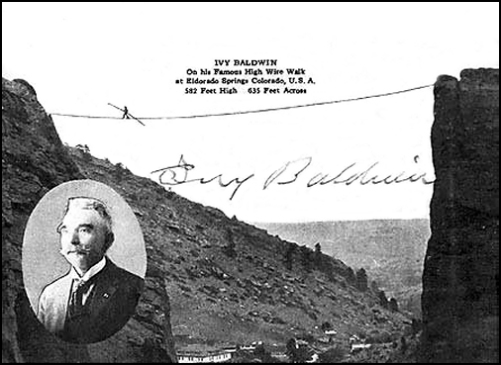 by Adele Lam A Colorado pioneer, Ivy Baldwin was well known for his acrobatic feats. Ivy Baldwin at 12 ran away with the visiting circus. It was there that he learned wire-walking as well as balloonist skills. Born Will Ivy in Houston in 1866, he later adopted the name of Ivy Baldwin a circus acrobat. 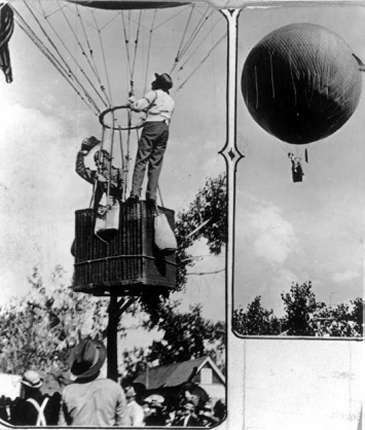 In 1890, John Elitch brought Ivy to Denver where he performed balloon ascensions and parachute drops at Elitch Gardens. He loved Colorado and became a life-long resident. At 14 Ivy made his first crossing over South Boulder Canyhon at Eldorado Springs. He made a total of 87 crossings the last on his 82nd birthday. As a balloonist in the Spanish-American War, Ivy Baldwin was a member of the Signal Corps and did reconnaissance for the American Army. With the advent of the airplane, he became a specialist in parachute jumping and made more than 2,800 jumps from balloons and airplanes. His various stunts took him around the world. He once performed for the Emperor of Japan who had a silk kimono made for Ivy with pictures of him and his wire act embroidered down the front. Ivy Baldwin was small in stature, barely weight 100 pounds and 5'3" in height. His slight figure belied his courage and adventurous spirit. He never wanted to quit. When is walked the high wire he used ordinary cloth shoes with resin soles. He balanced himself with a 26-foot pole weighing 10 pounds, on each end of which was a 1 pound knob. His most dangerous walk took place in San Francisco in 1885, when he walked a wire stretched over the Pacific Ocean from Cliff House to Seal Rocks, with a pounding surf below. Ivy Baldwin died in bed at age 87 in 1953 at his son's home in Arvada, Colorado. In 1974, the high wire at Eldorado Springs was taken down so as not to tempt adventurous youth. Editor's Note: This article was found on the website of the Boulder History Museum. The specific page can be accessed by clicking on the title, just below the photograph. However, at least using my Microsoft Internet Explorer browser, the page would not display properly. (9-21-03) I was able to copy the photograph and the text which you can read above. I will try to contact the Museum to alert them to this problem. ONLINE RESOURCES - I If you search for "William Ivy Baldwin" using the Google search engine, (9-21-03), you will find just three links, including this one. However, the one just below is especially valuable and offers a wealth of information, both text and photographs. Ross-Barrett Historical Aeronautics Collection This website of the Denver Public Library offers Two Galleries. "Early Airplanes" offers 12 large, beautiful photographs of early aeroplanes ranging from the Taube, (1914), to the Bell VTOL, (1954). The "Colorado Contributors to Aviation" gallery offers brief biographies of 18 distinguished Colorado aviators, including William Ivy Baldwin, John F. Curry and Will "Billy" Parker accompanied by wonderful photographs. To visit the site, click on the title above. To view the photographs, you must scroll to the right. ONLINE RESOURCES - II If you search for "Ivy Baldwin" using the Google search engine, (9-21-03), you will find 169 links, including the one reproduced at the top of this page. If time permits and you are sufficiently motivated, you have access to a wealth of information. FIRST AIR FLIGHT IN NEVADA (June 23, 1910) This page describes the Nevada Historical Marker 179 which marks the flight of Ivy Baldwin in 1910. You can learn the loction of the marker and also read the text of the inscription. You can access the site by clicking on the title above. William Ivy Baldwin Ivy Baldwin (ne William Ivy), the oldest EB in point of military service, died in his cabin at Eldorado Springs, Colo., last October 8, 1953, aged 87. He was born in Houston, Tex., July 31, 1866, to John F. and Elizabeth Ivy. After joining Sam and Thomas Baldwin in 1883 he adopted the name Baldwin. He had already started his ballooning career in 1880. At the urging of Lt. Wm. A. Glassford he enlisted in the Signal Corps in 1894 and headed the first balloon "train" since the Civil War. BY 1896 the Army's one balloon had become useless and Sgt. and Mrs. Baldwin built a new one which Sgt. Baldwin flew at Santiago in 1898. In 1910 he built and flew his own airplane. He is survived by his sons Harry and Ira W. Baldwin of Ogden, Utah; a daughter and two grandsons.